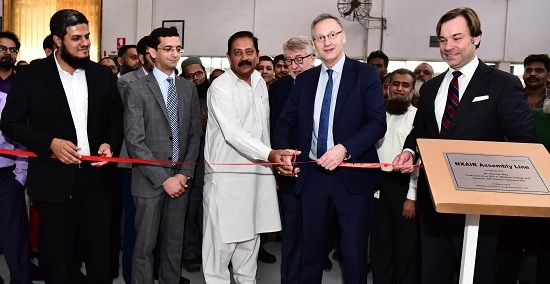 Siemens has strengthened local manufacturing in Pakistan with a new production line for the company’s latest technology in air-insulated switchgear, the NXAIR. Produced at Siemens’ Karachi factory,the NXAIR medium-voltage switchgear is an essential part of efficient, reliable and safe power distribution in cities, infrastructure, buildings and industrial plants. The new production line operates to Siemens’ global manufacturing standards and will supply infrastructure development in Pakistan. It allows Siemens to streamline its logistics in the country, bring technology to market faster and support economic development with knowledge and technology transfer. The latest version of NXAIR combines flexibility, high personal safety and low operation and maintenance costs for sectors where reliable power is essential, including data centers, manufacturing, electrical utilities, petrochemicals and the oil and gas industry. Highly adaptable, NXAIR can also be custom-designed for individual requirements including challenging climatic conditions with extreme temperatures and high air humidity, as well as in cases of heavy pollution of ambient air with dust, gases, salts or chemically active vapors. Siemens has been a technology contributor to Pakistan’s development since the early 1920s, and currently employs more than 700 people across Karachi, Lahore and Islamabad.